Victorian Premier Daniel Andrews historical ‘world first SORRY speech today to Victoria’s LGBTI community in Parliament was nothing short of breathtaking. His heartfelt sincerity, compassion, contrition, commitment and conviction to righting the horrific wrongs had my heart in my chest and tears soaking my cheeks. The character of Colonel Fitts in the movie American Beauty sprung to mind at the end of the speech broadcast. Fitts was the violent, homophobic and bigoted tyrant who lived next door to Kevin Spacey’s mid-life bungling character Lester. Fitts who spouted fanatical contempt for homosexuality was all along covering up his own repressed homosexuality and in a final scene we see him attempting to passionately seduce Lester. This scene had a profound affect on me as it confirmed with absolute clarity how cruelty, outward hatred, ignorance and arrogance was often borne from peoples own repressed feelings, insecurity, failure and lack of courage to face their own foibles, beliefs and humanity. And therefore oppressing others, turning a blind eye to injustice, following a mass pack mentality and refusal to ask the important life questions was the result of wide-ranging lack of self acceptance and self esteem. The issue why people cannot and will not say sorry often centres around accepting our own, others and collective societies imprudence, ignorance, arrogance, fears and overarching beliefs of not being good enough. So to elevate our self worth and spot in life we will push other people down, make them feel less than, castigate, bully and alienate them. And in no way try to truly understand, show compassion, work with, learn from and admit our own naivety, inexperience and lack of knowledge. For it is when we set up a ‘THEM’ vs ‘US’ that we, in our conscious and subconscious worlds can feel better about who we are (in a deluded way). From such a platform you see people hiding behind their behaviours by attempts to Rationalise, Re-assure and Justify that their actions are acceptable and warranted. Observe the volume of flagrant excuses strutted by people, organisations and governments who clearly are in the wrong – its pretty deafening! 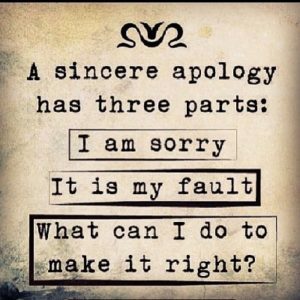 Many people and organisations struggle with admitting their blunders of judgement or actions and just cannot and will not contemplate offering an apology at all. Daily in the business world we see the stiff facades as people try to save their own skin and look good for the boss, clients, board, suppliers, staff, colleagues etc . As humans we all stuff up, treat others poorly and make mistakes at times. But admitting our errors and saying ‘I’m so sorry I was wrong’ is viewed as weak and unprofessional with a fear of retribution. ‘I’m so sorry’ is one of the most powerful phrases in the world. It can shift mountains of despair, alleviate hurt, elevate self esteem and purpose, encourage honesty, build partnerships, foster trust and most importantly allow situations and relationships to really repair, grow and succeed. But there is a catch – and it’s about the intention and motivation for giving an apology in the first place. We have all received the insincere flippant ‘sorry’. We have heard the ‘sorry’ to assuage guilt. We have heard the ‘sorry’ to manipulate and we have heard the sorry to ‘just get me the hell out of the room’. And lets not forget the ‘ it wont happen again’ insincere sorry. And other catch – sincere apologies should not be given in the expectation of forgiveness. Sure it is a nice by-product but respecting other peoples ability and desire to forgive is another whole matter. Sure, we can ask for forgiveness but it should not be the motivation. Its about ‘righting a wrong’ and ‘contrition’. The apology delivered by Premier Andrews today had all the right motivations. It contained deep contrition, historical context, awareness, impact reflection, a way forward and a promise for change and a commitment to not allow it to happen again. It was the makings of the only type of apology that is meaningful. Who should you or your business be saying I’M SO SORRY to ?